As many New Jersey residents know, Super Storm Sandy had a powerful and lasting impact on the New Jersey Shore. Even two years out, reminders of the storm’s passing can still be seen in the damaged homes that sit vacant and untended and the drastically altered shoreline. But some of the changes wrought by Super Storm Sandy are not so visible. 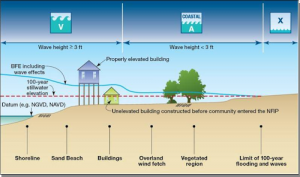 One of the most drastic of the ‘invisible’ changes to the Jersey Shore has been the redrawing of coastal flood maps in the state. FEMA spearheaded this effort as a means to help predict and mitigate damages caused by future storms. This redrawing represents the first revision to New Jersey’s flood plain mapping in nearly twenty years and was issued in December of 2012. These new flood maps establish a Base Flood Elevation (BFE) for those homes that fall within potential flood zones. Under federal regulations, these homes must undergo home elevation and be raised above a set height or suffer significant insurance penalties. Homeowners who fail to do so could see their home insurance rate skyrocket by thousands of dollars per year. The initial redrawing of the flood maps in the state put tens of thousands of homeowners in the position of needing home elevation in New Jersey. However, these first maps have seen some revision. In June of 2013, FEMA issued revisions in their flood mappings for Atlantic, Monmouth, and Ocean Counties. These new maps scaled back the areas labeled Coastal ‘V’ Zones; those areas that are likely to see severe wave action over 3-feet in a future hurricane. The scaling back of ‘V’ Zones means that thousands of affected home owners now reside in ‘A’ Zones. While homes in ‘A’ Zones still require damage mitigation efforts, such floodproofing requirements are less strenuous. For example, where as a home in a ‘V’ Zone may require a rise of 8′, a home in an ‘A’ Zone may only require a three foot home elevation. Even those who have had their risks downgraded may still choose to undergo more extensive home elevation than their zone requires. The wounds of Hurricane Sandy are still fresh, and many home owners would rather ‘play it safe’ than risk the damages and hardships of another storm. 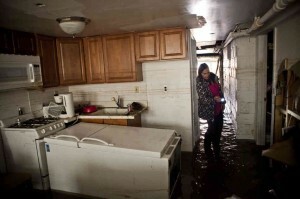 The higher a home sits, the less likely it is suffer catastrophic damages from future flooding. Insurance agencies, whose investments and expenses are wholly risk-based, offer significant home insurance discounts for home that are elevated two or more feet above the BFE of their area. In many cases, these discounts can outweigh the initial cost of a home elevation in a matter of only a few years. Whether you choose to have your home raised to the BFE of your area to stave off insurance penalties, or to have it raised even higher still to enjoy the benefits of further reduced premium payments, be sure to choose an experienced New Jersey home elevation firm to handle the project. Penn Jersey Development company has been fully involved in the Sandy Recovery process from the very beginning and offers exceptional service in home elevation. Our skilled staff and expert planners have the experience and specialty tools to complete your home elevation in a safe, timely, and cost effective manner. Penn Jersey Development is committed to proving that the Jersey Shore is ‘stronger than the storm’. Call us toady and talk to one of our home elevation experts. Protect your home and the investment it represents with home elevation from Penn Jersey Development. 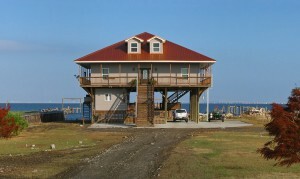 Home elevation from Penn Jersey Development puts your home above the waves and out of harms way.